Some might find it hard to believe that before their success with albums such as Rumours and Tusk, Fleetwood Mac was actually a blues rock band formed by guitarist Peter Green in 1967. 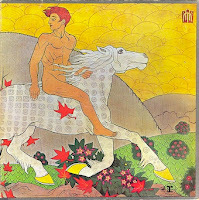 Fleetwood Mac’s third album, Then Play On, is often considered by many to be their best effort when Green was in the band. The album is also the last the band would make with Green, as he left the band a year after the album’s release in 1970. Now in 2013, the album has been reissued and remastered with the original U.K. tracking list and segues.